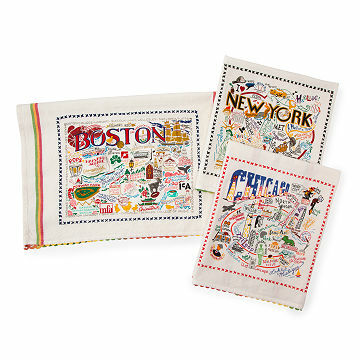 These embroidered dish towels capture the flavor of your favorite cities. Show hometown pride or love for your adopted town with these vibrant city dish towels. From New York's famous skyline to San Francisco's iconic bridge, these towels capture the flavor of America and Europe's urban pantheon with flair. Each towel is silk screened and then framed with a hand embroidered border on a 100% cotton dish towel. Three stripes down both sides and hand dyed ric-rac top and bottom add a charming touch. Images may vary slightly due to revisions. Made in India. Click here to see all available City Dish Towels. Machine wash with cold water; do not bleach. This towel is a perfect gift for someone with a Brooklyn connection. Great gift to remember the folks back home! I gave this dish towel to my sister who was retiring and moving to Florida. I also gave her the matching pillow. Both are very colorful and depict scenes from Pittsburgh. The pillow was pricey, but a perfect accompaniment to the fish towel. Bought this for a Secret Santa, she loved it! Perfect gift for our Chicago friends! Bought this towel for family friends in Chicago. Can't wait to see it hanging in their kitchen! Great Gift - Tells the Story of Where You're From! It's well-made and comes in an attractive bag - so if it's a gift, you don't even need to wrap it! well made and personalized on a general level. everyone loves them! i've gotten/given Brooklyn, CO, NJ, NYC, Boston College, etc and people gush. I've also taken one of mine (the Jersey Shore) and framed it for our great room- it looks amazing!